SPRINGBANK stylish self-catering holiday house..................in the shadow of Ben Cruachan. 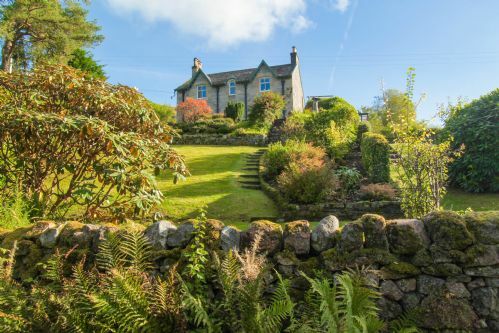 A relaxing yet imposing granite-built house standing majestically over the picturesque village of Taynuilt with views to Loch Etive. This fine Victorian house dating from 1885, with lots of character and original features, sleeps up to 8 in comfort. It is set in mature gardens to lose yourself in. Short break at Springbank with friends and kids mid October 2018. Had a great stay mid term break (Mond-Friday) with family and friends. 4 adults (40 somethings) , 4 children (2 sixteen year olds and 2 thirteen year olds). Instructions on booking and location sent in advance of visit, all clear and no issues in arriving. Scenery on route fantastic with great autumn colours, lochs and a pleasant drive for us. Stopped for couple of drinks and food at Ben Cruachan Hotel en-route; excellent views, good food, very pleasant staff and would recommend a visit. Arrived late afternoon and easily accessed house. It was a little cold for the girls on arrival (although personally I like that, as by the time you unpack and get into any house in late Autumn in Scotland the wind has blown through the place anyhow). That said the thermostat was turned right down, but easily identified and adjusted and the place soon warmed up. Log burner in main living room was also a great addition (instructions in the table for anyone that is unsure on operation). 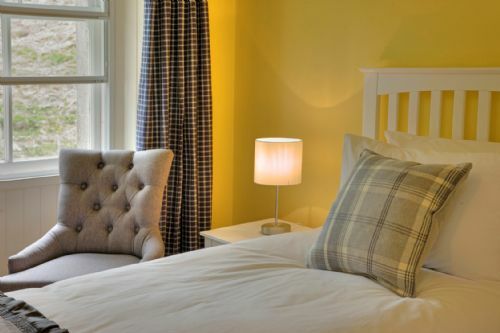 If anyone prefers a warmer bedroom, than take the double room over the main lounge. We have stayed in numerous houses over Scotland over the past 6 or so years and generally look for somewhere to relax, access to a bit of walking (hills or forest), a good table for dinner, somewhere to have a few drinks in the evening, all in a location that still gives us options and for us the house and its location worked really well. It was a good size for us and generally well equipped. Rear entrance has plenty of space for coats/shoes, a large enough a second sitting room should anyone wish to break off for a bit, plenty of space in the bedrooms and toilet/shower accommodation, a great dining room that everyone could easily get round the table for dinner/supper, utility with additional fridge and freezer space and washing facilities should they be needed. 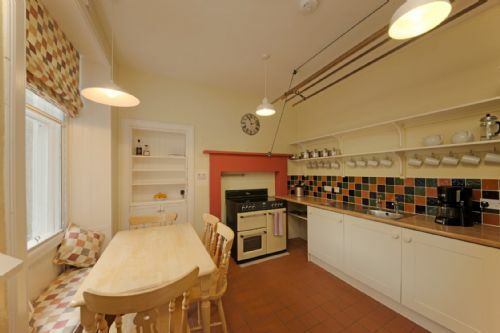 Kitchen was also good size and well equipped (although it would have benefited from an extract over the cooker). We had a really good week in the area (train into Oban, Oban Distillery (inc kids), hiked up to the dam from the route under the rail station, some flatter terrain walking (a short drive from the house), local sight seeing on boat tour from Oban). Overall we thought it was a great house and offered good value, in a quiet location that gives good access to local train or roads. Lots of nice touches, artwork which helps place it, great showers with plenty of hot water, clean towels and reasonably well stocked with bits n bobs you might need when away but forgot to pack (although that might not be everyone's cup of tea, we thought it worked well). Whisky taster and chocos also welcomed, although recommendation to owner to stock up with a few prosecco glasses - plenty of everything else. Thanks again to the owners and management team for our stay. We very much enjoyed our stay at Springbank! It was a perfect end to a 3 week journey across Europe. Although it was rainy (as expected), we were able to take full advantage of the house. If you are looking for a place to relax, this is it! This property is well equipped and full of charm. The location is lalso great! Having the train station a short walk away along was handy and the local grocer and butcher made us feel like neighbours. This lovely home is highly recommended! Thank you for the great customer service. which the dogs enjoyed too. Another great family holiday at Springbank. Our 2nd year at Springbank. 6 adults and 5 children. House excellent for our needs, lots of cooking and sitting out the front in the evenings enjoying the views. Good base for exploring the whole area from Oban to Glen Coe, which again we did. Fresh eggs from down the road a bonus. Service from Samantha at West Coast Cottages was very helpful. Could do with a tumble drier and better drying racks. Could do something to get rid of or soften the low slanting doorway to kitchen, we had some nasty bumps. Bins were full on arrival (including general rubbish in recycling bins) and not emptied on schedule. Samantha sorted it for us very quickly but it would be better to arrive to bins which are useable. We loved our stay at Springbank. The location was central to exploring Oban and Mull, as well as the mountains in Glencoe and Ft. William. The house was fully equipped. The only thing that would have made it better was fans to help cool and circulate the air, or installing screens on the windows. I know it's very rare to have screens, but I can't understand how people leave windows open with those midges! I was eaten alive and miserable with the windows open, yet very hot with them closed. But.....I don't want to complain about lots of sun in Scotland! Shower soap and shampoo were also not included, which would have been nice at that price point. But....those things were certainly not enough to ruin the trip. We loved it and would love to return. Excellent property, wonderful area. Really enjoyed our stay. The house was beautifully clean when we arrived. It was well equipped and the views were amazing. Thank you. We stayed here over Christmas, two family groups consisting of young adult, teenagers and parents. the whole booking process from start to finish has been incredibly easy and by far the easiest of any holiday home we have booked before. Sam is a fount of knowledge including recommending where to buy our turkey from, the local butchers, to supplying photos of the oven to see what we would be able to fit in on Christmas day! The house is a beautiful old Victorian place with four large bedrooms, comfortable beds and three lovely bathrooms which meant you never felt it was crowded. A lovely decorated Christmas tree was also in the sitting room, which had a warming log burner with a basket of logs ready to use. There were presents left for our two teenagers which was a lovely gesture. Also a miniature bottle of whisky and bowl of tea cakes was left in the dining room which very quickly disappeared!! The kitchen has to be the best equipped kitchen in any place we have stayed on holiday. We cooked a big Christmas dinner, as well as baked cakes and biscuits during our stay. There is a whole array of spices to use as well as food which I presume has been left by others. A pet hate of mine is arriving at a rented house and finding there isn't even any soap left but at Springbank everything is provided from all cleaning equipment, soap, toilet rolls and washing up liquid. In the village, a short walk from the house, there is as mentioned a fantastic butchers, a post office that sells papers and a green grocers too. There are walks from the house and we would recommend the nature reserve two miles up the road for a walk or two. The views from the front door were outstanding and gardens well maintained. The property is also dog friendly which was a big plus point for us. This was truly a real home from home. Springbank is a wonderful place to stay. The house is big, beautiful, very good equipped and warm. We found everything we needed - in the kitchen, laundry room or in the two living rooms. 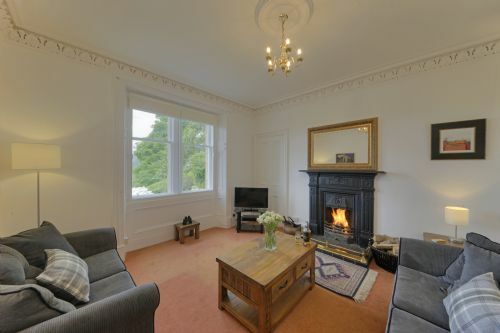 It is very nice decorated and the view over Taynulit and Loch Etive is breathtaking. In the village is a small grocery which is open every day. The Etive Restaurant is closed now, but it is worth going to Kilchrennan Inn - nice location and good food. When Robin's Nest is open you can have a breakfast or lunch there. They have tasty scones and toasties. There is a butcher and a small post office in the village. We had perfect weather so I enjoyed sundowns at the pier every day - it is maybe 15-20 minuts walk from the house to the Loch. In the morning often a stag would say hello while we had our tee in the kitchen. That was amazing! It is only 12 miles by a car to Oban where you can shop (Tesco, Aldi, Lidl, Costa, Boots and a lot of cute other small stores and galeries), they have great see food at the haven and one can go for a day trip to Mull. Don't miss the Oban Distillery! We went to Port Appin, Castle Stalker, Glencoe, even Stirling. 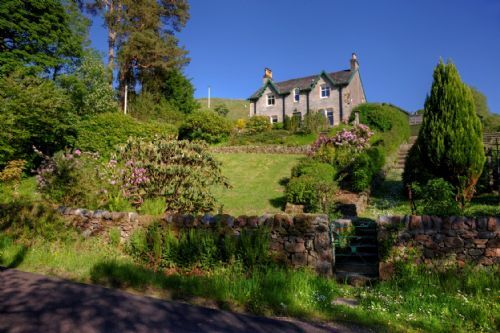 I would book this house again if I will go with a couple of friends to Scotland:-). Our two week stay at Springbank House worked out very well for our party containing grandparents, parents, teenagers and children. The house is very well maintained and comfortable. It provided for all our needs, although a tumble dryer would be useful and so would some soft covering on the low sloping doorway to the kitchen - some of us are quite tall. The view from the front of the house is stunning and the garden is most enjoyable. The few village shops are good (pity there is no pub), the railway station is handy and I recommend the Inverawe Smokery. There are good walks from the house or nearby. The location was also good for getting into Oban (which we really like) and for car trips slightly further afield to places such as Glen Coe. All in all the accommodation met our needs almost perfectly. 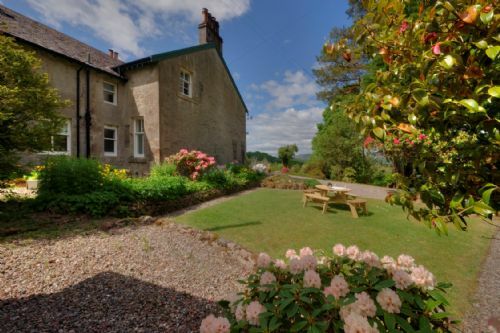 We stayed at Springbank House in January (our party consisted of me, my husband, our three children and our two dogs. We only have one regret, which is that we didn't book for longer! My first impression on entering the house was how clean it was. It was truly immaculate and extremely well presented. The bedrooms were warm and inviting and the pillows were amazing!! Combined with the tranquility (the house is set back from and elevated above the main road. We didn't hear any traffic whatsoever and had the benefit of amazing views) I genuinely had the best nights sleep in longer than I can remember. There were plenty of bathrooms too (the kids loved this fact, as did I) one of which was particularly opulent (and therefore quickly claimed by me!!). Beautiful. 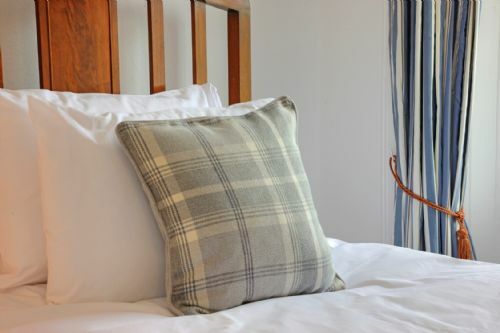 We came to Springbank House because we just wanted to relax after the hussle and bustle of Christmas and New Year and yo not have to do very much and at Springbank House we were able to do just that because it was so well equipped. We had stocked up on necessities on the drive up but in all honesty needn't have bothered. The house was so well stocked - even had a supply of basics (tea, coffee, sugar, oil, spices) some of which may have been left by previous guests but rather than throwing perfectly good supplies out, they were left behind for other guests to use and enjoy and / or replenished by Sam and her husband who do a wonderful job running the business and literally couldn't have done anymore to make us feel more welcome. The kitchen was also fully stocked with utensils, there was a fantastic washing machine and dishwasher, a pulley for dying clothes and a separate utility room, which made a perfect (and very warm) sleeping place for the dogs. The dining room was stocked with Tunnock's tea cakes too, which the children loved and are now huge fans of! The house was a little cold when we arrived as it had been empty for a few days although to be fair to Sam and her team the heating had been turned on for our arrival, which was amazing and very welcome. We lit the coal fire on the second day and bought a sack of coal for further fires (this was more for effect as the house quickly warmed up) so if you like coal fires, I would recommend grabbing a sack of coal en route. We will do that the next time as we will most definitely be back! I can thoroughly recommend Springbank House. Very comfortable stay. We are 8 walkers/cyclists so we found it very convenient for our activities. Great views from the property with local amenities handy and further afield Oban shopping was excellent. We had an excellent stay at Springbank. It was a very cold weekend and the house was well heated and had an open fire in the lounge. It's a well equipped house and very comfortable. A couple of small points.The two radiators in the two front lounges could do with being upgraded.The small lounge particularly as the open fire was unusable. 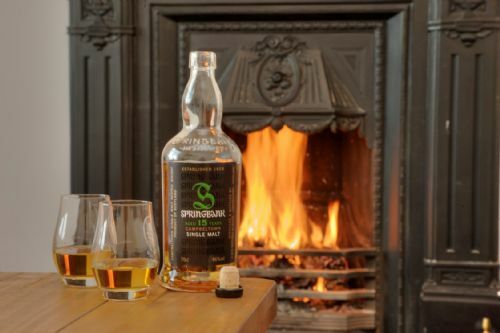 We found Springbank to be very comfortable and accommodated our family of four plus my Mother and father in-law with ease. The location was excellent, looking out over the Loch down the valley beyond. There was lot's to do in the area and I highly recommend the Staffa tour as a must do while in the area. Springbank has ample grounds to wander in and the area was very quiet and peaceful. On the down side there were no locks on the bathroom doors and we found a lot of fluff under the main bathroom bath which blew out from underneath when we opened the window but these things are easily rectified. Overall I would definitely recommend Springbank as a base to discover the Highlands and Lochs. It is a lovely old house full of character. Excellent stay in this beautiful house very well equipped. We spent a beautiful holiday week , which allowed us to discover Scotland and enjoy the comforts of home for a rest . A highly recommend . We loved Springbank, it is full of history and atmosphere, furnished with excellent taste and offers a great view (amazing sunsets)! We passed a wonderful week there and felt very welcome, the right place to enjoy Scottish atmosphere and to relax, we found great books and games and films there, so even on rainy days we had plenty to do. We were a party of 6 adults. 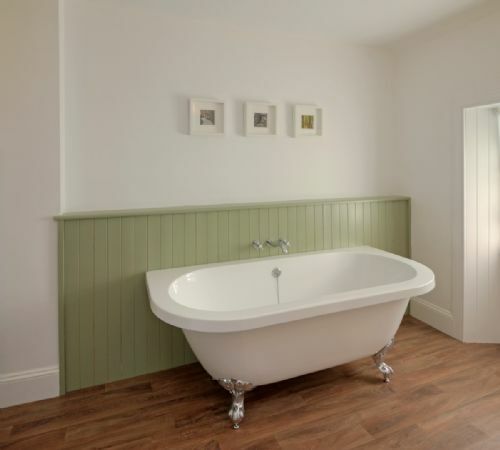 The house was easily spacious enough and a mix of old and new, lovely original fittings mixed with modern. Kitchen is perfect for cooking, we did more here than in any other holiday house we have stayed in. Excellent range of equipment. A lovely new dining room which linked onto a utility room where you could dry walking gear, and included an extra fridge which was a good store for all the wine and beer. Three bathrooms and 4 bedrooms upstairs were immaculate and towels and linen were of a high quality. 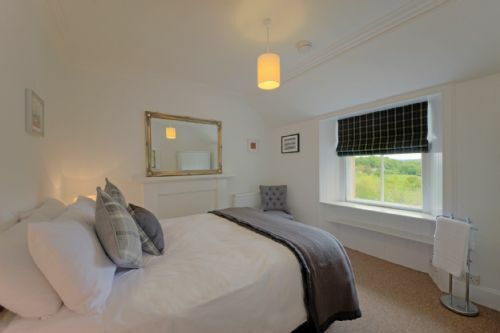 All in all the house was a delight but what I wasn't expecting were the amazing views...you could lay in bed and look out over Loch Etive, or lay in the bath and look out over hills and trees. The garden is beautiful too...but not enclosed so we spent a lot of time shouting on our dog :-).